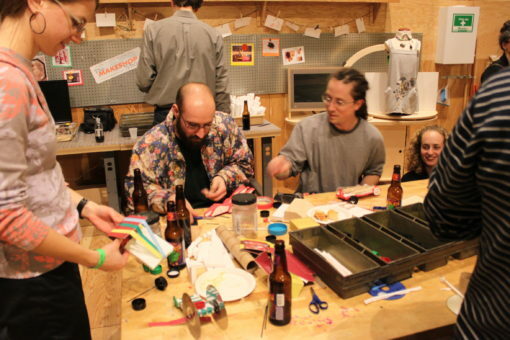 The third MAKEnight, an after hours event for adults, was held onFebruary 7th and it was a blast! Over 150 adults visited the museum for a fun night of making. We had many activities in MAKESHOP and STUDIO that encouraged people explore and create. In MAKESHOP, we let people felt using special felting needles along with a form of wet felting that allows you to turn a sheep’s wool into a felted creation. We also let visitors build a mini-derby car out of recycled materials and let them race their cars on a ramp. The competition between couples was heated and hysterical. Some of the adults spent over an hour designing their derby cars. The STUDIO had some neat activities too. Visitors could silkscreen onto fabric or t-shirt. There was also an activity where you could create a bath fizzy. The results were very colorful and messy. For this event, we also hosted composer and pianist Tom Roberts, who wrote an original score to two hilarious Charlie Chaplin films. We screened both of these films with Roberts on piano and accompanied by clarinet. Save the date, our next MAKENIGHT will be April 4th from 6:00 to 9:00 PM. Check it out.